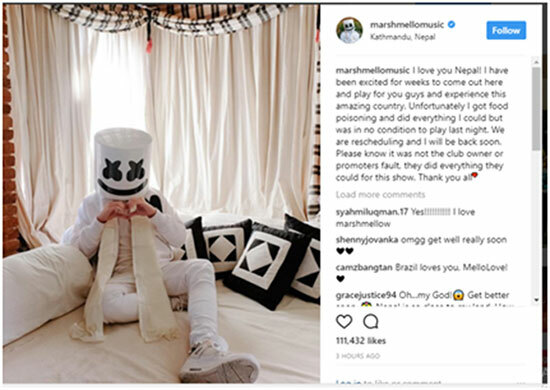 KATHMANDU, Dec 15: Kathmandu District Court on Friday ordered the police to investigate the seven individuals accused of swindling the money promising to hold a live concert of international artiste Marshmello in Kathmandu. The court has ordered the Metropolitan Crime Division (MPCD) to investigate into case immediately by taking the accused into custody. Seven individuals including cricketer Prithu Baskota have been accused of swindling money promising to hold a live concert of American Singer ‘Marshmello in Kathmandu. Live concert was scheduled at Durbar Marg-based Club Deja Vu on Wednesday night. Metropolitan Police Range Office, Kathmandu, said it has received an order from Kathmandu District Court to carry out investigation into the case by taking the arrested into custody. Those seven arrested are likely to be remanded in custody after the fans lodged a complaint stating that they were cheated by the organizers. KTM Live Entertainment and 61 Live Pvt. Ltd had sold tickets to the audience ranging from Rs 3000 to 7000 assuring them of holding ‘Marshmello Live Concert in Nepal,’ at Club Déjà vu in Durbar Marg at night on December 13. 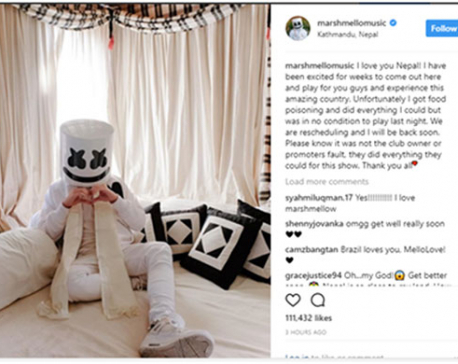 The situation took an ugly turn after fans and audience who were waiting eagerly for Marshmello live concert lost their temper and began to vandalize the club when the organizers announced cancellation of the concert at 2:30 am on Thursday, citing the artiste’s health problem. Metropolitan Crime Division has arrested Raju Maharjan, Ritesh Marwadi, Yanab Shrestha, Mayank Khadka, Bishal Dangi, Milan Shrestha, Rajiv Maharjan, Club Captain Akash Neupane including Prithu Baskota in connection with Déjà vu vandalism case.